It’s always good to have a print record of Hillary’s words. Let’s not twist and spin her words out of context. Save that muscle power for the laundry. 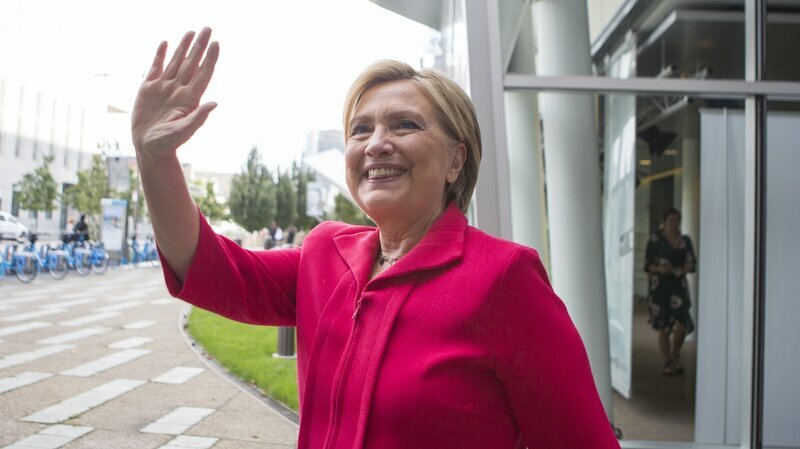 Hillary Clinton says she would not rule out questioning the legitimacy of the 2016 election if new information surfaces that the Russians interfered even more deeply than currently known. In an interview with Fresh Air‘s Terry Gross about her new memoir, What Happened, Clinton acknowledges that such a challenge would be unprecedented and that “I just don’t think we have a mechanism” for it. On the night of July 4, 2017, HBO aired a documentary entitled The Words That Built America. Both Hillary and Bill Clinton appeared in it. It was a bipartisan effort. Many Democrats and Republicans participated. It focused on the Declaration of Independence and The Constitution. The previous July, at the Democratic National Convention, Khizr Khan had offered his pocket Constitution to Donald Trump. Pocket Constitutions went like hotcakes after that. All of which is to say that Americans, particularly Hillary supporters, had both the means and the reasons to review the U.S. Constitution over the course of that year. Since the election last November, and increasingly after the inauguration as the ill-begotten Trump presidency rolled on, many voices called for the nullification of what evermore apparently was a flawed election. Early on, I joined that chorus – one time. A lawyer friend quickly pointed out that there was no Constitutional mechanism. I went back to the Constitution. Indeed, there is none. Thereafter, for awhile, whenever I saw these cries to invalidate the election, I reminded my friends of this glaring absence. Some simply responded with, “True.” Others suggested that we can change the Constitution, which is also true, but we cannot make such a change retroactive. Troll: We can change the Constitution. Me: Yes, but we can’t make that change retroactive. Troll: Yes, we can write it in. Me: It would never be ratified in that form. The electoral states she lost will never ratify an amendment like that. Me: Hillary had a whole contingent of lawyers, both paid and volunteer. If a lawsuit had a basis, don’t you think they would have done this already? Troll: You just don’t want Hillary to be president! Why do you say you support her? You are a Bernie or Trump supporter. As I have mentioned, I have not figured out what their agenda is other than to ramp up emotions among Hillary supporters. When a cool head intervenes, that individual is accused of disloyalty to Hillary. I do think that the mission is driven by emotion- particularly anger. They want Hillary voters riled up. So! I am glad to see a very cool head, the candidate herself, who also is a lawyer, making my point. I am not gloating. I just dislike seeing my fellow Americans baited and barking up the wrong tree. Edited 09/19/17 to add this. A friend posted this, and the first comment was “Make the precedent!” I wish people would spend as much time and energy contacting their Reps – (202) 224-3121 – as they do telling Hillary Clinton what to do. Once again – there is no mechanism! Now get on the phone and get to work defeating the Graham-Cassidy Bill.